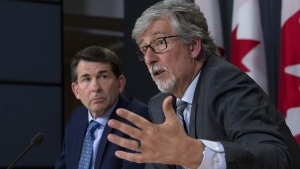 OTTAWA -- The federal government is stepping in to help the struggling Canadian media industry with new tax credits and incentives valued at nearly $600 million over the next five years. "To protect the vital role that independent news media play in our democracy and in our communities, we will be introducing measures to help support journalism in Canada," Finance Minister Bill Morneau said in his speech to the House of Commons. The full details of the program won't be available until the next federal budget, after the government receives advice from an independent panel from the news industry. The goal is for the program to be funded by the government but have no role for politicians to decide what constitutes a media outlet or who would be eligible. That way, the government hopes to avoid the appearance of conflict between a free press and government influence. The program will likely cost the federal treasury about $45 million in 2019-20, rising to $165 million in 2023-24. It's expected most of the expense will be for a new tax credit for media organizations to support the labour costs of producing original news content, but finance officials said specific amounts won't be available until eligibility details have been decided. Another temporary tax credit will be created for subscribers to digital news media sites. Plus, the government will allow non-profit media organizations to apply for charitable status, enabling them to seek donations for which they could issue tax receipts. Non-profit media with such status would also be eligible to receive funding from other registered charities. La Presse, Canada's largest French daily newspaper, moved to become a non-profit entity earlier this year, severing ties with the Power Corp. conglomerate owned by the Desmarais family. Conservative finance critic Pierre Poilievre said his party would never endorse assistance for journalism. The Conservatives believe government help for journalists interferes with press freedom and Poilievre said the government is choosing who gets to sit on a panel that will ultimately decide which news organizations survive and which don't. "We should not have a situation where the government picks a panel that then decides who gets to report the news," Poilievre said. Morneau dismissed the idea the government is buying journalists. Phillip Crawley, publisher of The Globe and Mail, which owns a share of The Canadian Press, said he welcomes all three of the initiatives as well as the government's stated commitment to the value of independent journalism. "I think it will help give some confidence to media owners that there is something here they can work with," said Crawley. He said the government has made it very clear it wants no say in what counts as journalism for the purposes of these funds, adding the make-up of the independent panel will be crucial to ensuring the proposals don't interfere with press freedom. Crawley said the Globe gets 55 per cent of its revenues from subscriptions and the proposals will both encourage subscriptions and help media companies hire journalists to produce high-quality content that attracts subscribers. The Globe has also talked to the government about creating a separate charitable foundation to solicit donations from people and organizations that want to invest in certain types of journalism. John Honderich, chair of Torstar Corp., which owns the Toronto Star and a number of other newspapers as well as a share of The Canadian Press, said he is encouraged by the proposals. "They should significantly help the media sector as it transforms to a sustainable digital future," he said in a statement. More than 250 news outlets in Canada have closed in the last 10 years and newspaper revenues alone are down as much as 40 per cent since 2012.